MONTGOMERY, Ala. (April 11, 2019) – Yesterday, an Alabama House committee passed a bill that would abolish marriage licenses in the state and effectively nullify in practice both major sides of the contentious national debate over government-sanctioned marriage. Sen. Greg Albritton (R-Bay Minette) introduced Senate Bill 69 (SB69) on March 5. The legislation would abolish all requirements to obtain a marriage license in Alabama. Instead, probate judges would simply record civil contracts of marriage between two individuals based on signed affidavits. On April 10, the House Judiciary passed SB69 with a “favorable” recommendation. The Senate previously passed SB69 by a 26-0 vote. Similar bills have been introduced in Alabama every legislative session in recent years. Last year, SB13 also passed the Senate and the House Judiciary Committee but was never brought to the House floor for a vote. While this change in the law may seem like semantics, it would be quite significant. It would end the requirement to get state permission before getting married. The state would merely record signed contracts between consenting individuals. The proposed law would maintain a few state requirements governing marriage. Minors between the ages of 16 and 18 would have to obtain parental permission before marrying, the state would not record a marriage if either party was already married, and the parties could not be related by blood or adoption as already stipulated in state law. Civil or religious ceremonies would have no legal effect on the validity of the marriage. The state would only recognize the legal contract signed by the two parties entering into the marriage. In practice, the state’s role in marriage would be limited to recording marriages that have already occurred. Passage of SB69 would take a step toward returning to the traditional Western custom in which the state had little to no involvement in marriage, even though it was a legal contract as well as a religious institution. Marriage in medieval Europe technically fell under the legal jurisdiction of the Catholic Church, with priests officiating weddings at the door of the community church. However, it was ultimately a private arrangement that did not require a third party in order to be considered legitimate. In fact, state marriage licenses were initially used as a way to prevent interracial marriages. As a 2007 New York Times op/ed points out, licenses later became necessary in order to subsidize the welfare state. 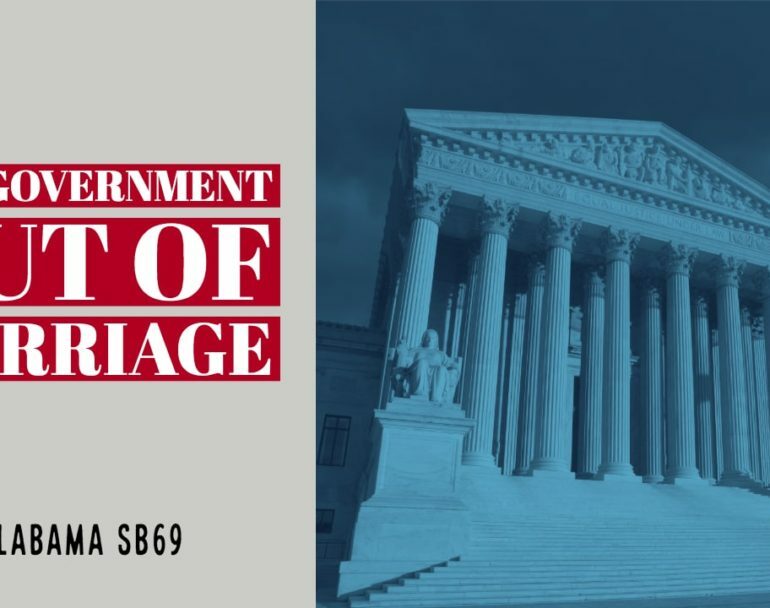 In a modern political context, SB69 would reduce the state’s role in defining and regulating marriage, which has become a contentious issue and places a burden on government officials torn between the legal requirements of their jobs and their personal religious convictions. By limiting the state’s role in marriage, the legislation would allow Alabamans to structure their personal relationships as they see fit without interference or approval from the government. Something rarely considered by those seeking to control the state’s definition of marriage is that a marriage license means a person requires government permission before getting married. In America, people generally cannot drive a vehicle without a license. People cannot practice law without a license, nor can they provide medical care. Put another way, under a licensing scheme, marriage is not a right, nor a religious institution, but a privilege granted by the state and limited by its requirements. Consider this: In the same way a driver can lose their license if they break certain traffic laws, a man or woman, theoretically, could one day find their marriage license revoked for breaking certain “marriage” rules, whether it pertains to childrearing or their religious and political convictions. Constitutionally, marriage is an issue left to the state and the people. Removing state meddling in marriage would render void the edicts of federal judges that have overturned state laws defining the institution. The founding generation never envisioned unelected judges issuing ex-cathedra pronouncements regarding the definition of social institutions, and the Constitution delegates the federal judiciary no authority to do so. SB69 must now be brought to the floor for a vote.